Ms. Condello is a partner in the law firm, Neuberger & Partners LLP. She joined with Joseph A. Neuberger, in 1998. She was part of the first group of paralegals to be licensed by the Law Society of Ontario. Ms. Condello’s areas of practice include defending clients charged with criminal summary conviction matters, Provincial Offences and Small Claims Court. In addition to her practice, she assist lawyers with the defence of many high-profile and complex criminal cases, involving the review of disclosure and evidence, the preparation of the exam and cross examination of witnesses, and legal research. Ms. Condello graduated from Mohawk College of Applied Arts Law Clerk program in 1996, and became certified in Civil Litigation through the Institute of Law Clerks of Ontario in 1997. She completed the Osgoode Hall Certificate program in Provincial Offences Court Practice. Currently, she is enrolled in a Bachelor of Laws program at the University of London and pursuing a law degree on a part time basis. 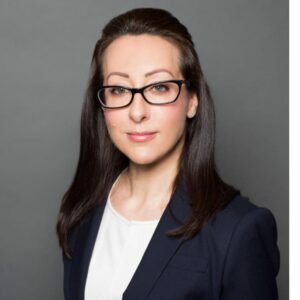 Ms. Condello is a speaker for Continuing Professional Development programs through the Law Society of Ontario, Durham College, and other CPD providers. I am a former Director and Treasurer of the Ontario Paralegal Association, an organization whose mandate is representing paralegals throughout the Province of Ontario.